Whether or not to use stop losses is one of the great debates in investing. I think that you should, because they work, and they will save you money and stress. Stop losses act as a simple exit strategy, one of the most difficult parts of investing to master. They also allow the investor to monitor prices less frequently, which can be a psychological help. We wrote previously about Tim du Toit of Quant Investing’s work on stop losses. His own research had made him sceptical – stops reduced volatility and large drawdowns, but impacted returns. So he looked at three academic studies. Kaminski and Lo (2008) applied stops to a US stock portfolio from 1950 to 2004. When the market fell by 10%, stocks were sold and US government bonds held until the market returned to its previous high. This worked well until the dot com boom of 1999, when the model kept getting back into the market too soon. Even when dot com was included, the model outperformed the market and reduced losses. Snorrason and Yusupov (2009) compared normal and trailing stops against buy-and-hold on the Stockholm index between 1998 and 2009. Trailing stops move up with a rising share price, remaining a fixed percentage beneath the highest traded price. Some brokers offer automatic trailing stops. They traded once a quarter, reinvesting cash after 3 months, and tested stop losses of between 5% and 55%. Han, Zhou and Zhu (2014) used a market-neutral momentum strategy of buying the 10% of the US market with the largest share price increase over the previous six months, and short-selling the 10% with the largest share price falls. The model was applied to price data from 1926 to 2011. Stop losses work, especially over the long-run – they give higher returns with lower variability and smaller drawdowns (hence higher risk-adjusted returns). They work primarily because of the disposition effect, where investors hold on to their losing investments and sell those that are winning. This is the opposite of the investing maxim “cut your losses and let your profits run”. Explanations of the effect include loss aversion, sunk costs and the endowment effect. Stops are also useful in combating indecision, and in removing confirmation bias. Stops have different purposes for different investors. The academic studies above used switches between stocks and bonds or stocks and cash. These are in effect market timing strategies for long-term, “buy and hold” investors. More active investors would use stops to “retire” stocks from their portfolios, replacing them with a “better” stock from their watch list. This is all about allocating capital to the best prospects. From the literature, 15% to 20% seems to work best. But for a short-term trader using leverage, this would be a very distant safety net. Technical analysts (chartists) will use support and resistance levels and / or trend lines to work out where to place their stop. Moving averages as stop levels are also common. Fundamental analysts might look at the volatility of the stock. Or they might not use stops at all, believing that a quality stock remains quality at any price, or at least until their original investment thesis proves incorrect. They will remember that one time they got stopped out of Apple in a flash crash. These guys will be buying more if the price goes down. The main danger of using stop losses is that you will be stopped out by short-term volatility. This is particularly the case with the smallest stocks, where many investors believe that market makers (or their trading algorithms) deliberately target stop levels in order to stimulate trading activity. For this reason it is worth avoiding round numbers and obvious support and resistance levels. You should always place your stop far enough away that normal volatility – or even fairly excessive volatility – will not trigger it. A second problem is that in fast markets the price will “gap” and may miss your stop (unless you have paid for a guaranteed stop eg. on a spread bet). If you are unlucky, your stock will be sold at the bottom, locking in a big loss. Some brokers offer stop-limit orders, where the sale is triggered by a price fall below a stop level, but is not executed unless the price remains above a second limit level. If such an order is not executed on the way down, it’s often best to cancel the order so that it isn’t triggered on the way back up. Another way around these problems is to use price alerts rather than actual stop-loss orders.4 These offer greater control by allowing you to consider the bigger picture before deciding whether or not to sell. It’s usually best to start with real stops, and then move to mental ones once the habit has been formed. Other ways to insure your stock portfolio include complementary options and / or spread bets, which move in the opposite direction to your stock positions. 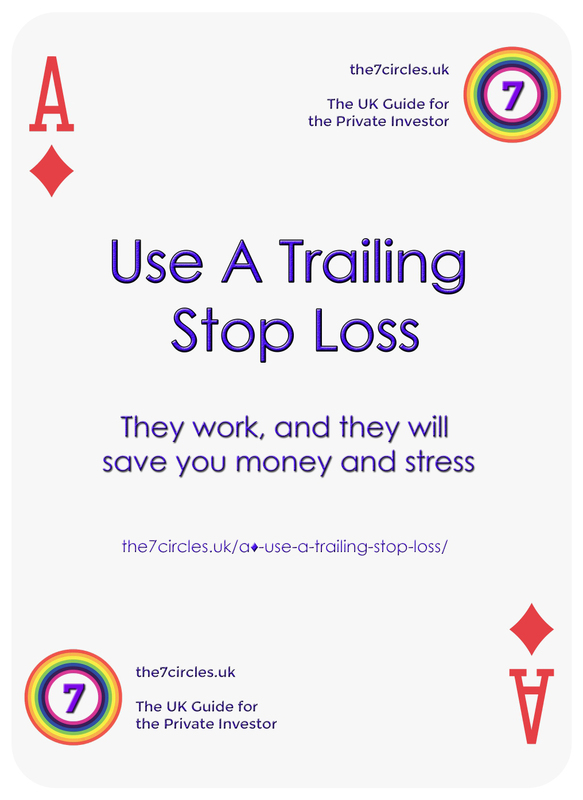 Whichever implementation approach you choose, always use a trailing stop-loss – they work, and they will save you money and stress.